There are tons of people out there who write and podcast some wonderful, thought provoking ideas about investing. They really know their stuff and often do more justice than I could ever do. I usually defer to their thinking. That’s the thing. There are a lot of people who write ABOUT investing, but I wonder at the back of my mind if they PRACTICE it just was well as they write about it. 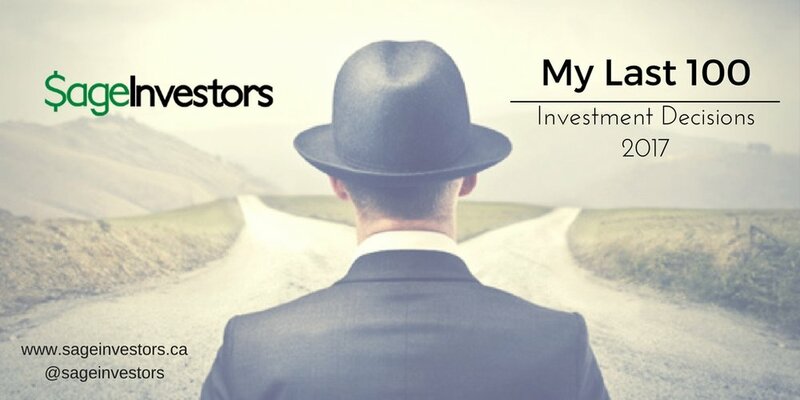 For regular readers of my website and my blog, I post monthly all my investment decisions I’ve made for my stock portfolios along with a rationale and explanation of the my thought process that went into it. I also tweet in real time every buy and sell decision I make through my @sageinvestors handle. It’s a practice I’ve learned to develop as it forces me to take some pause and reflect on the decisions I’ve made. It also nurtures one of the qualities of the Sage Investor brand which is to walk the talk and practice what I teach. I want people to see that through implementing practices such as asking the 8 questions that they can learn through the Everyday Investing program and my course on Exchange Traded Funds can yield positive outcomes. I was going to post another performance scorecard for my portfolios with a bunch of numbers, and I will continue to do so at the end of the year, but I was thinking that there must be another more tangible way to demonstrate how effective or ineffective my investment decisions have been. I find now that looking at the traditional portfolio returns do not provide insight into the investment decisions. They provide a snapshot at a point in time. They show the end result, but they do not show the process and mind mapping that was done to get to those results. For those who are Do-It-Yourself investors, the ideology and practices are very helpful. You could leave your portfolio in cash and still generate returns but does that necessarily mean you are making successful investment decisions? Maybe, and I’ve written about how doing nothing is a hard thing to do. Then it hit me that what would be interesting is to go back and review the last 100 investment decisions I’ve made and to see what were the outcomes of those decisions and see if I can discover any interesting patterns or observations in my behaviours, both bad and good. Why 100? Because it has a sort of a “what have you for me lately” feel as well as it represents a pretty decent sampling of activities that as we’ll see covers a pretty extended period of time and were made in some both exuberant milestones and periods of economic malaise. Before we dive into the data, I wanted to provide some additional context on what defines an investment decision. For purposes of this analysis, I define an investment decisions as an iteration where I opened a position in buying a stock or ETF and eventually selling that position. Each buy/sell combination would represent an iteration. So I went back and identified the last 100 iterations starting from today’s blog post date. Also for purposes of this analysis, I looked at buy/sell transactions involving individual stocks and ETF’s investing in stocks, commodities, and ETF’s that go long/short a specific index. I did find I invested in ETF’s that went long or short on specific currencies but I didn’t include them because my decisions to invest in those type of ETF’s were driven more by hedging out some currency risk, which I guess you could say is an investment decision in its own right. I really like looking at my performance this way because the returns are realized where tangible cash is either being physically generated or destroyed and that's what counts in investing at the end of the day. You can't pay for your groceries with paper profits (although you could use those paper profits as collateral, although I suspect the personal finance illuminati would have heart palpitations going down that road). In baseball, a batter who hits .300 (i.e. gets 3 hits every 10 at bats or said another way is out 70 percent of the time) is considered a top tier hitter. Hit .400 (4 hits every 10 at bats) and you are a baseball God. So if my investing decisions were like baseball at-bats, I would be batting .790! I went back over the data to see if I made any mistakes and the numbers still checked out. I’ve had a feeling that I have been able to make good decisions on buying and selling stocks profitably but I really never quantified it so to see that almost 4 of every 5 iterations of investment decisions had positive outcomes was a complete eye-opener. I dug deeper to get a breakdown of those successful iterations and I’ve listed them below. I found that out of the 79 profitable investment decisions, 12 or 15.2 percent of those decisions yielded returns of between break-even and under 10 percent, 26 or 33 percent of decisions yielded returns in between 10 percent and under 20 percent, while 31 or 39 percent of decisions yielded returns in between 20 percent and under 30 percent, and finally 10 or 13 percent of successful investment decisions yielded returns of at least 30 percent or higher. So almost 85 percent of my successful investment decisions yielded double-digit returns. Again truly stunned. Average return was 10.9 percent. The median return was 18.10 percent. It's also worth noting that I did not factor dividends in the total returns. It's purely about capital gains. My investment ideology does not factor in whether a company pays or dividend. Naturally if you worked dividends into this equation the numbers would see a bit higher.. But did you beat the market? Beating the market on a consistent annual basis is pretty much impossible. It's a Bay Street/Wall Street obsession only because their compensation is tied to this mythical pursuit of alpha in perpetuity. For me, I don't need to go there. The best I can expect is that my investments earn the long term return for stocks, which for the past 150 years is about 6-8 percent. As long as I'm around that neighbourhood, I'm OK. I realize there will be bad patches. Comes with the territory. You probably noticed that I have no selling activity in 2013. Even I was perplexed. It turns out I didn’t sell one stock in my portfolio in 2013 so I didn’t complete any iterations. It turns out I didn’t have much incentive or impetus to do anything. I was more than content to play with cards that I dealt. I did buy some new stocks but I interestingly enough I didn’t jettison anything. The numbers reinforce a core element that makes up my investment ideology. For every investment I’ve made, I have an implied goal or expectation that it will generate a return of at least 20 percent. Given that 71 percent of iterations yielded at least 10 to 30 percent it confirms that I’ve been staying pretty true to that ideology. This is up from 63.5 percent in my last report. When a stock or ETF get’s near this internal threshold, I make a decision on whether to sell it and bank the profit or hold longer. More often than not, it appears that I have been selling when it crosses around the 20 percent threshold. For me a 20 percent return is a desirable expectation as it firstly preserves my purchasing power. I’m generating enough wealth and profit to offset any impacts of future inflation. Second and this may sound cheesy, a 20 percent return is a good solid number for me. It’s enough profit for me that I don’t feel greedy. It disciplines me to keep emotion out of the selling decision. It satisfies me. I sleep better. It’s a realistic return to achieve knowing that my analysis has shown that on a valuation basis there is enough upside on the stock to get a tail wind and get there without incurring excessive risk. It’s low-hanging fruit. When I do sell there is nothing stopping me from buying back in if the prices falls and the fundamentals of the business or ETF is still intact. In fact 36 iterations were repeat buy and sells of a stock or ETF I had previously owned. One element I was interested in was how long I held these positions. Did I flip these positions frequently like a day-trader or did I exhibit a more buy-and-hold type of behavior. The first thing that struck was the period of time between the first iteration and the 100th iteration. I thought that the period would come in around 4-5 years. In my previous report the period stretched back as far as over 8 and a half years. It is now an additional year at 9 years and 7 months. The first iteration began on January 2, 2008 and ended on December 23, 2009. The 50th iteration took place between June 2012 and September 2012, almost 5 years ago, so it appears I have been holding my positions consistently and for long periods of time. It’s interesting that the first iteration occurred in 2008 just before and during the financial crisis so most of the iterations that occurred were either in the midst of the crisis and the aftermath, which saw stock prices crater as much as 35 percent and as high as tripling or quadrupling in the years after thanks to uber low interest rates and non-stop money printing by the central banks. Here are some more fingertip facts on the holding period of the 100 iterations. Average holding period fell slightly to 402 days versus 419 days or 13.6 months in my previous report. My investment ideology involves selling stocks when they have reached their intrinsic value or at least achieve a return that I am confortable with. It appears that I’m OK with holding a stock for multi-years or at least review on annual basis, which seems reasonable. The iterations with the longest holding periods were the same as in the previous report: 2101 days (MegaBrands), 1973 days (Patheon), 1507 days (Global Water ETF), 1462 days (iShares Emerging Market ETF), and 1461 days (Vanguard Emerging Market ETF). It’s interesting the 2 longest holding periods were on stocks that were the worst performing iterations. I lost 84 percent on MegaBrands and 69 percent on Patheon. Does this mean that buy and hold is bad? Well not necessarily because if you go further down the list, the Global Water ETF returned 22 percent, and the two Emerging Market ETF’s returned 25 and 24 percent respectively. Make no mistake, those two positons had a profound impact on how I invest, not just because I lost a ton of money, but in other ways that involved enhancing my awareness of behaviors that I feel contributed to these epic losses. Up until those iterations, I never established firm exit positions which would be if the stock goes down below x percent then I automatically sell the position no matter what. MB and PTI were stocks I was so convinced were going up. I ignored game changer type events in the companies. In the case of MegaBrands, kids were dying as a result of accidently swallowing tiny magnets in the toys. I ignored it as one offs. In the case of Patheon, the company was having enormous production and quality control problems in their Puerto Rico plant and management had not demonstrated any competency to address the issues. I again ignored it and focused on the numbers too much. The numbers I crunched were telling me these were solid wealth creating companies in durable industries. I was in love with the stocks and the sectors. I couldn’t bring myself to cutting the cord until it was too late. Basic math on losses gives us a stark reality check. If you lost 20 percent, you need your investment to go up 25 percent to get back to break-even. If you lost 50 percent then you need the stock to go up 100 percent (i.e. double in value) to just get back to break-even. It becomes next to impossible to consistently recover from these types of loses but we let them happen because emotions and hubris often cloud our judgement. It clearly clouded my judgement on MB and PTI. I realized that after those iterations, that I need to bring some more discipline and take that emotion or infatuation out of my decision making process. I began to instill stop-losses of 20 percent on every iteration. If the stock was down 20 percent I would sell, no questions asked. I learned from that experience that managing losses is just as important to managing gains. If you look at iterations since that point the worst losses I incurred were in Best Buy (lost 18 percent), Trican Wells (lost 21 percent), Blackberry (lost 19 percent), Neulion (down 22.5 percent) and Under Armour (down 37.7 percent). Controlling losses means preserving more wealth. Managing loses is an important skill I try to instill with people I work with. The experience with MegaBrands and Patheon also forced me to develop a greater awareness of what I call Game Changer moments, moments where specific events, actions, strategic decisions that companies make that can alter the direction of the company and stock both in a positive and negative manner. The events at MB and PTI were Game Changer moments and bad one’s. People were dying using a product. The quality and efficacy of drugs being produced was being questioned. These are negative events and the companies were never able to recover from it. I’m much more cognizant of it now and again it’s a behavior I try to instill with my protégés. The breakdown of 100 iterations in terms of industries and sectors shows my decision making wasn’t skewed into specific types of businesses. I was into everything, Technology, oil and gas, manufacturing, luxury retail, discounted retail, healthcare, telecoms, broad-based ETFs, emerging market ETF’s, specific country ETF’s. I was all over the place. The common theme for all the companies and it’s more about the individual stocks is that they were led by strong management teams, selling products society wants and generating strong Economic Profit via Returns on Invested Capital that are greater than their cost of capital and whose stocks appeared to be cheap. These elements formed the basis of my investment ideology and I believe staying true to my investment ideology in good markets and bad markets has played a factor in making successful investment decisions. As I went through the data I thought about maybe I should have kept going past the last 100 iterations and go as far as I have records. I might. It would be interesting especially if I could back to the late 1990’s and the dot com bubble as well as into the early 2000’s when the whole thing popped. Who knows maybe the numbers could be worse and regress to a 50/50 flip of the coin outcome? When reviewing past performance it is very easy to get into a mindset of if I was able to do this in the past, I can automatically do this in the future. Recency bias in investing can have a nasty habit of punching you in the face. What I do take solace is that the decisions span a fair amount of time and through various market ups and downs. I take some comfort that despite the context of the volatility, I appeared to be consistent in how I executed these buy and sell decisions. I tried to keep emotions to the side as much as possible. Sometimes you have to learn and practice this through making some decisions that don’t pan out. It’s an occupational hazard of investing. It comes with the gig. For me this was a fascinating dive. It introduced me to new things about investing. It also reinforced some elements that I feel are important to being a successful investor. Hopefully I can keep it up or at the very least keep moving in the right direction.